Hello Beautiful People, We are back with new windows article where we are going to share an interesting tutorial article Fix ERR_SPDY_PROTOCOL_ERROR In Windows 10. In Daily Life, If You are using Chrome Browser On Your Device and Facing more issue then This Article is Special For You. So Here We are going to share Fix ERR_SPDY_PROTOCOL_ERROR In Windows 10. Keep reading this working guide to solving err_spdy_protocol_error. Google Chrome is One of the best Browser Nowadays better than Mozilla Firefox and Internet Explorer. Using Google Chrome Browser, You can easily Surf Anything from Google Chrome Browser. It is Best browser compare to Mozilla Firefox and Internet Explorer. 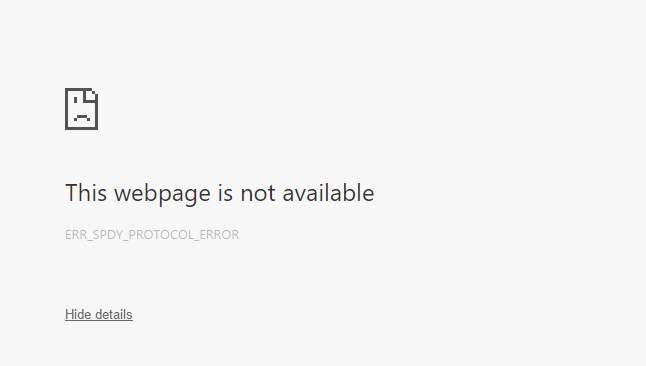 When You are browsing Different sites like Facebook, YouTube, Reddit, Wikipedia or Tumblr and You are getting Error Like this webpage is not available err_spdy_protocol_error. So This Article is very helpful to solve this error. Now We Are focus On Main Problem solution where You can fix this Error Easily Using below different methods. Here We Are going to share Different methods to Solve this issue Easily. You can fix this Error On Your Device. Before going to fix this error using different methods, Let’s Try Simple Method like clean the cache Of Browser. If You can’t fix this issue using Clean the Cache then Using below different methods, You can err_spdy_protocol_error permanent fix. So Let’s Get ready To Fix ERR_SPDY_PROTOCOL_ERROR In Windows 10 Using Flush Socket Method. Firstly Turn On Your System And Open Your Google Chrome Browser. Now Click at the top right corner of the screen and click on “Flush Sockets.” From the drop-down list. Now Click On “Flush Socket Pools” And Again Come back to the Error page to check is it working or not. If it is not working then try below different method. If You are getting err_spdy_protocol_error google chrome then Try t0 Update Your Google Chrome New Version. Maybe It will be fixed After Updating Google Chrome Browser After Updating to the new version. There is many Reason to fix this error after updating Google Chrome Browser because a Current version of Chrome Browser is coming with Bugs and That’s Why You are getting This Type of Error On Your Browser. So Simple, Update Your Browser and Fix this Error. Firstly Open Your Chrome Browser and Click On 3 Dots Menu. Then Click On New Incognito Mode And Open it. Open The Avast Anti-Virus Software and Click On Menu Settings option in the Avast Security software. Then click on Customize Web Shield Protection In the active protection tab. Now Add Your Websites In That Section Properly. Finally, We Share Different Methods To Solve ERR SPDY PROTOCOL ERROR In Windows 10. If You Fix This Error Using above methods then Share This Article With Your Friends and Family Member Those Who are facing this Error.